Blogging for Myself: 38 Oxley Road: DPM Teo, what is your private interest? 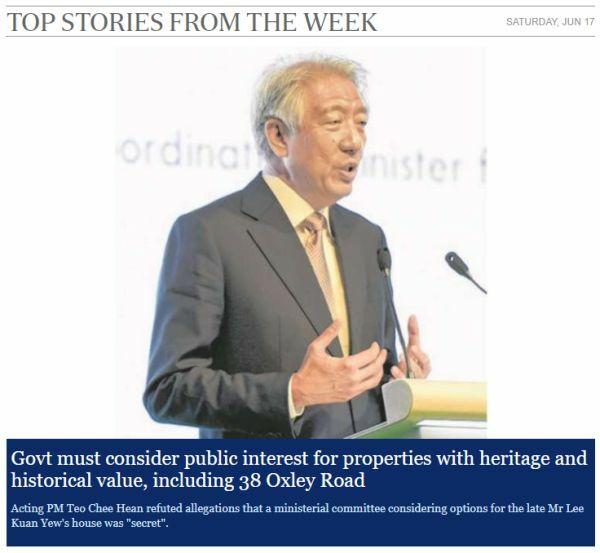 38 Oxley Road: DPM Teo, what is your private interest? I did a thought experiment. We saw countless people showed up to say their last good byes to LKY slightly more than two years ago. Imagine with me as you exit parliament house a survey is conducted asking you if you would support tearing down his bungalow 38 Oxley Road because that was what he had repeatedly said publicly he and his wife wanted. Could you say No to him? After all that he had given to us, is a simple request like this too costly for us? Now imagine many years later when all these are now recorded as history. What would our descendants think of this generation who took the decision to preserve the house? It was a callous generation who could not even grant such a simple request and the value system that went with it as symbolized by his living and leading. That is why I am doing my bit to fight for the last wish of LKY to be honored. It would also be educating future generations right. I am convinced the public interest is to give LKY what he wanted. Now I must ask the PAP government what is your private interest? I can't imagine any praiseworthy reason they could offer. I have been receiving many memes satirizing the PM and the ministerial committee but nothing poking fun at LHY. I guess this kind of indicate what the public interest is, if not at least a large and motivated group wanting to see LKY wish of demolishing the house fulfilled. The Cabinet and PM should not be so blind as not to sense this. As far as I and many friends who have discussed this at length. We mostly agree there is no national interest, only party interest and self interest. Lky is a smart man. When he left 100% to lhl, he ensured that lwl + lhy are the executors and trustees to demolish the house. In otherwords, PM lhl only gets the land but not the house. Any blind man on the street can also see that. The siblings only have 1 important job, lky only have 1 wish. Let's make sure they get it done. I suggest the committee disband itself and let this private matters rest. Otherwise, I support the siblings in taking the no confidence vote immediately and demand an inquiry for abuse.